This Paris boutique hotel is just 2 blocks north of Cathedral de Notre Dame. The rooms are small, but quiet. The hotel is decorated as if the Pierre-Augstin Caron de Beaumarchais was living in it, so think 18th century. Much of the furniture is antique. The rooms do have the 21st century requirements including wi-fi and hairdryers. What sets this Paris boutique hotel apart for me is the people who run it. The first time I stayed there, I hadn't gotten my bearings yet and asked for directions and one of the staff walked me halfway to my destination. Also on my first stay there, I asked where I could catch a cab the next morning. The man behind the desk called one of the other guests who he also knew was leaving in the morning and asked if she would mind sharing a cab with me. Breakfast is extra, but well worth the money - more food than you can eat for breakfast and everything fresh and homemade. I would take the fresh fruit with me for my day of exploration. Sounds like a wonderful hotel. I'll have to check it out for my next trip to Paris. Join in and write your own page! It's easy to do. How? 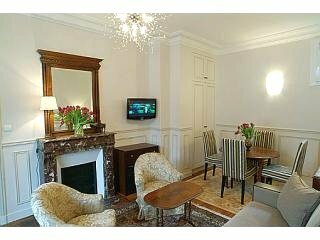 Simply click here to return to Paris Boutique Hotel Reviews.